Home Mister Dude CustomerUnService I was a Fool at the Motley Fool – Beware! It started when a really smart friend of mine, Todd, went to work there. Todd has interesting cerebral skills that I find amazing. So when he went to work there, I thought it was an interesting move. Then I learn the Fool’s focus is about investing and helping investors. Investing has been on my radar for a while as well. So I started listening to their podcast. I think it is one of the best podcasts out there. Quick, to the point (Chris Hill), some humor, very well produced (Steve Broido) and most of all informative. So when I fell upon a video about 3 up and coming stocks, which was entirely too long, I decided to invest some time in the Fool. To save you some time, the video is a year old (October, 2012), and you can use Google to skip to the conclusion. From what layman’s research I have done, it appears as though had you taken their advice, it would have been a good return. So that’s awesome. I was interested in learning more, and I used (thank goodness) one of my junk e-mail addresses to sign up. Many of the clicks popped open asking for address and phone number, I skipped over those. I probably clicked about 5 or 6 of those boxes. The amount of e-mail that I got was immediate and voluminous. It was mostly the “you really need to click here to see what we really have to say”. I understand, these companies need subscribers to make money. The most valuable thing is an e-mail address. But the deluge of e-mail I’ve been getting since puts it all in the tl;dr category. Besides the feeling of being inundated with unspecific offers that the next click would send my portfolio to the roof, I started to get that sick feeling about all the email I was getting. A couple of them had a useful “manage your subscription” link at the bottom. 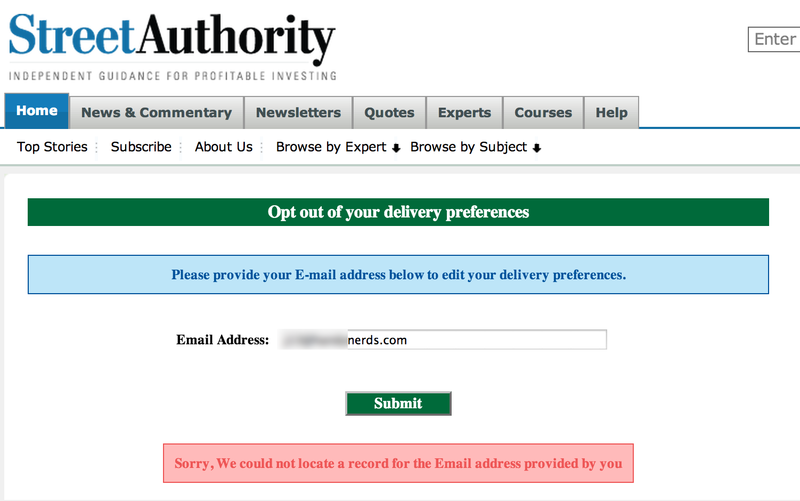 One or two even made a clear “unsubscribe here” link. But I ran into a fair number of these links, where you click on the link, it auto-fills in your e-mail address and then…. That was from clicking on their link, on their e-mail, that they sent to me that then auto-filled in my e-mail address into their form. So you have a hard time making a website for e-mail subscriptions, the bread and butter of your business, and I am supposed to trust you with my financial future? Yep, not going to happen. And as far as the Motley Fool goes… might I suggest a review of the standards of their advertising partners allowed on their website? 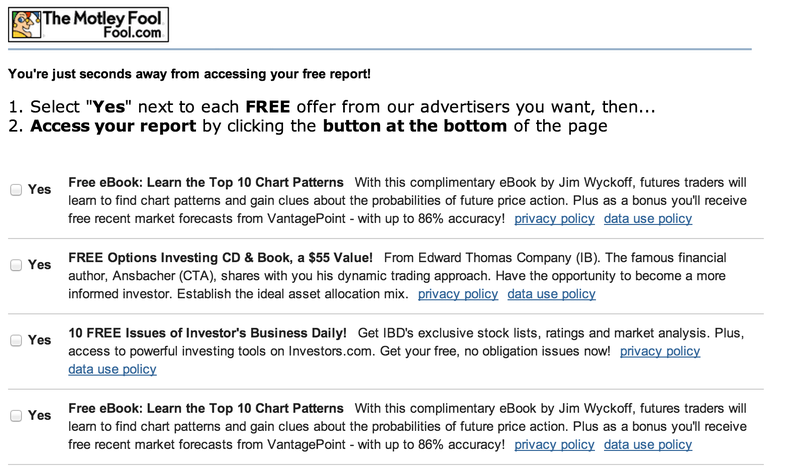 From what I can tell, the Motley Fool is one of the higher caliber / quality sites around. I think it would only improve their brand to work with those companies that will hopefully uphold their standards. For MisterDude.com, from the other side of the Internet, I’m Brett Thorson. P.S. To the cast & crew at Motley Fool Money, keep up the excellent work!